"Other countries have their history. Uruguay has its football." The World Cup is simply the largest sporting event in the world. The last final in Africa garnered around 715.1 million viewers, and FIFA estimates that the tournament as a whole generated over 25 billion views. Only the Olympics compare in terms of global standing, but they still do not match the passion and fervor the World Cup evokes in even the most casual of fans. During that one month of pure joy, almost every city square around the world is filled with lights, colors, and people. It almost feels like the entire human population is going through full bloom as part of a cycle that regenerates itself every four years. How startling it is then that the first World Cup may not have materialized at all. Unthinkable now, it is certainly how events seemed they would unfold 82 years ago. Among the obstacles were financial troubles, teams unwilling to travel, and an entire stadium needing to be planned and built. Even after the Cup set off, in the final there was disagreement as to which ball would be used, until both teams settled to use one for the first half and the other for the second. Given the immense and widespread popularity the World Cup has sustained for decades, it is hard to imagine a time when countries were reluctant to engage in mutual competition. The truth is that until the success of the first World Cup, most countries failed to see what would be gained from playing against each other. There remained an air of suspicion over the legitimacy and integrity of foreign styles of football. Strikingly, that suspicion was most profound in the progenitors of modern football, the English, who did not even enter the World Cup until 1950. The full nature of the cultural divide in early football is still being explored today, and the question is open on how far the world has come to overcome it. But in the context of the maiden World Cup, the efforts of the host country stand out in abolishing the distrust footballing nations held against each other. The Uruguayans sacrificed much, but never lost their principles, as they strove to stage the first true world championship. It is my hope that this piece will help explain how they accomplished that and why. The first international was played between England and Scotland in 1872 and ended in a 0-0 draw. Perhaps it was from that moment when the English disregard and impatience for foreign football was bred. When FIFA (Fédération Internationale de Football Association) formed in 1904 it constituted the Football Associations of France, Belgium, Denmark, Netherlands, Sweden, Spain, and Switzerland. The English were finally coaxed to join a year later, and they would finally be convinced of the new federation's worth when the problem of the 'English Ramblers', an improvised English football club, came to the focus of international football. The Ramblers were out to play games on the continent against the word of the English FA, and they were only stopped when FIFA forbade its members to participate. From then on, England would take a more invested approach to international football, and the English FA organised the 1908 and 1912 Olympic football tournaments, both of which England won. Afterwards the war set in, and FIFA, along with the rest of the world was thrown into turmoil. England would not return to the organisation as by then nations like Germany had joined, and England had no desire to associate herself with former enemies. 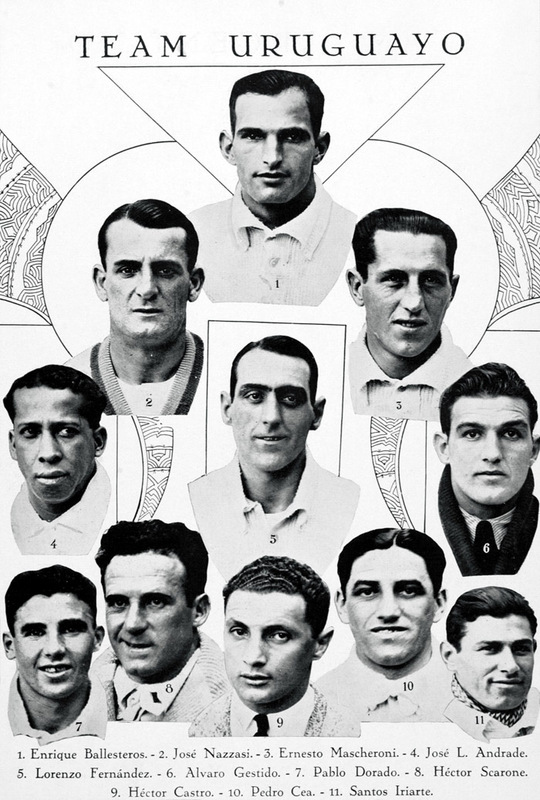 Still the 1920 Olympic tournament carried on, and in 1924 and 1928 Uruguay entered and won both tournaments. Amidst all of this a Frenchman, Jules Rimet, became FIFA president, and changed the face of international football forever. Jules Rimet was born to a humble grocer, and he would realize his dream to be a lawyer. During World War I he earned the Croix de guerre as a French soldier, and before that he was a Catholic activist who founded the Democratic and Republican Christian magazine, The Revue. Somewhere along the way he co-founded the Paris sports club Red Star-Saint Ouen, and after much involvement in the French Football Federation, of which he was president from 1919 to 1946, he was elected FIFA president in 1921. His grandson describes him as a "humanist and idealist, who believed that sport could unite the world". Rimet frequently spoke of "the need to reconcile the different classes in a Christian spirit and to relieve the moral and physical suffering of the poorest". He believed that football could contribute to "universal peace and brotherhood" and even recreate the spirit of medieval "chivalry". The gentleness of his heart was perhaps best known by his friends and family; His grandson recalls, "I remember him taking me on to his knee and he would talk to me about poetry, about books, about music, about nature, but never about football and never about his achievements at Fifa." 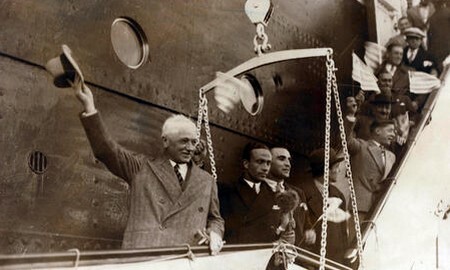 From the moment he became president, Rimet targeted a proper international tournament as being key to the sport's development. For this to happen FIFA would have to take charge to ensure that every participating nation fielded their strongest side and obeyed the laws of the game. While the Olympics had been suitable on a trial basis for international competition, they were not regarded seriously by either the observers or participants. The Olympics were stringent on the amateur status of their participants, and countries frequently brushed aside defeats claiming that their side had consisted of workers or army men, rather than professional sportsmen. Rimet knew that only a FIFA mandated tournament would deliver international football the legitimacy it so greatly needed, but he was also aware that FIFA would not be able to manage this alone. No doubt this inaugural tournament would face intense scrutiny from the footballing world, and for there to be any hope of future tournaments the preparations would need to be both diligent and exact. In the beginning Italy, Hungary, Spain, Sweden, and the Netherlands all submitted their candidatures along with eventual hosts Uruguay. Uruguay separated its claim with its willingness to reimburse travel expenses and offer free accommodation for all participating nations. Not stopping at that, they were also willing to incur all costs for preparations, and they would yield the ticket sales to FIFA to be split among its constituents. While Europe was in a state of economic instability at the time, Uruguay was prospering through its wool, hide, and beef industries. Through sound policies, President Batlle y Ordóñez used profits from the economy to boost education and urban growth. In 1930, Uruguay would be celebrating the hundredth anniversary of its independence, and being the World Cup host would only further galvanize and unite their people. As if the economic and social conditions in Uruguay were not favorable enough, Rimet could not ignore that Uruguay was already a sensation in international football. Not only had they won the 1924 and 1928 Olympics, they had done so in style. A refreshing departure from the aggressive kick-and-rush tactics which the English dominated with, Uruguay triumphed with an unseen elegance on the ball, combining in variations to dazzle both fans and the opposition. 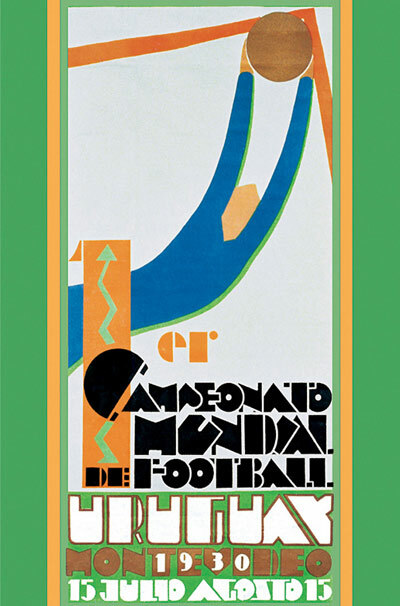 Rimet knew that if the Cup was to be a success headlining both the viability and value of international competition, its host would have to be Uruguay. "We were all working together, but there was a boycott, the Old World against the World Champions. There was very bad information in Europe concerning football in South America. It was the savages of America... It was a wild football, our game. It was an empirical, self-taught, native style of football. It was a football that was not yet within the canons of the management of football in the Old World, not remotely." It was only through the diplomacy and persuasion of Rimet that France convinced Belgium, Yugoslavia, and Romania to join them in the journey across the Atlantic. Aside from the Yugoslavian party, the remaining three European nations would share the SS Conte Verde which finally arrived in Montevideo on July 4, nine days before the competition began. The American teams were already in place: Argentina, Brazil, Boliva, Chile, Mexico, Paraguay, Peru, and the United States. The only matter that remained was a venue to hold the actual matches! While scramblings ensued throughout the country over the greeting of the hundreds of thousands of tourists and visitors, the central project Uruguay faced was a suitable venue for the players and the football. 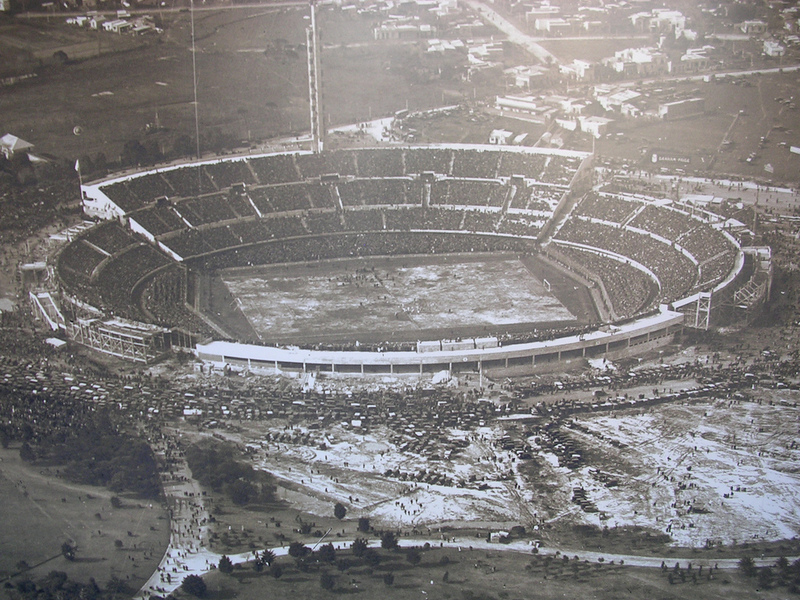 The Estadio Pocitos and Estadio Parque Central were minnows to the requirements of the tournament, and a new stadium the Estadio Centenario, named so for the centennial celebrations of Uruguay's independence, would need to be constructed to meet the demands of the crowds. The grounds for the Centenario was chosen to be a rugged ravine in Parque Batlle, Montevideo. Parque Batlle is known as the "pulmón", or lung, of Montevideo in recognition of the large amount of trees furnishing the area. The forestry serves a pivotal contrast to the spread of central avenues and rolling ramblas which normally entrench the city. However, building the Centenario upon such unwieldy earth was no small task. Much work was invested in the deforestation, soil removal, and leveling of the surroundings. Two companies took upon the task of building each half of the stadium, and concrete had to be imported from Germany to meet requirements. Heavy rains delayed proceedings throughout the project, and work was divided in to three shifts so that construction could continue around the clock. Still, the Centenario was not ready by the start of the tournament, and opening matches had to be played in Pocitos and Parque Central. "A double-tiered ellipse broken into four stands that fanned out like the multi-layered petals of an art-deco flower. The detailing of walls, walkways, and seats stayed faithful to a core aesthetic of flush surfaces and simple patterns. Two stands were named in honour of the Olympic victories - Colombes and Amsterdam. Expectations were running high; a third stand was to be called Montevideo." Indeed the bold bowl-shaped design by architect Juan Scasso stood thunderingly among the stadiums of the day. In addition to its two tiers it included three sections with base areas and a main tribune with three levels of tiers. On that main tribune the famous tower, La Torre de los Homenajes, was erected. The name La Torre de Los Homenajes delivers tribute to the medieval Tower of Homage which accompanied the castles of that era. 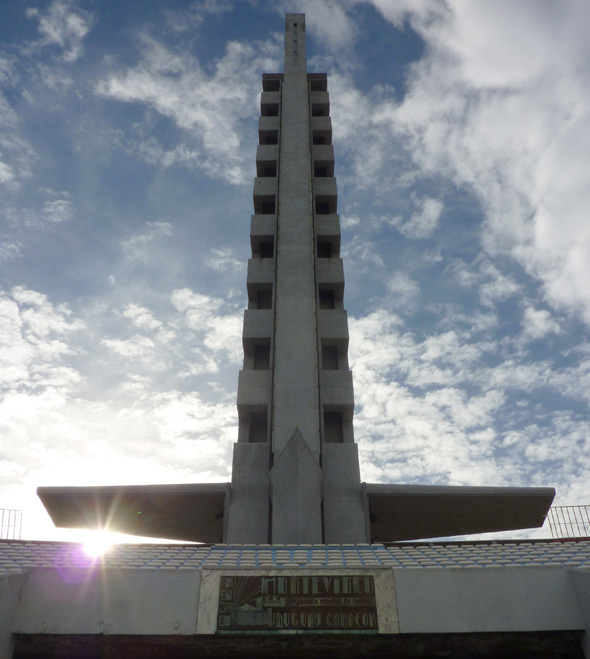 It stands nine stories tall with each carved window echoing the nine stripes of the Uruguayan flag. Slender, tall, and stately, the tower's temperament guards the public against the agitation which can overcome the masses. It would be the beacon of the World Cup and for all who gathered. "...the creators, invincible kings, masters of the past. They introduced football through the railroad concessions. So that teams were formed at all the stations throughout America. There began our confrontation with them. There was an enormous age difference because we were children of 17 or 18 years, and they were men with beards on their faces. They were the functionaries, the men in charge of the stations. They were all civil servants, and some were officials of the railroad companies, those that played." "We founded the school, the school of Uruguayan football, without trainers, without physical preparation, without sports medicine, without kinesiologists. Just us alone in the fields of Uruguay, going after the leather from the morning to the afternoon into the moonlit night. We played for 20 years to learn to become players, to become what players had to be: absolute masters of the ball." This philosophy of football soon became synonymous with the Uruguayan life. La Garra Charrúa, it was named, and it is still known to this day. The Charrúas were the indigenous people of Uruguay, and "La Garra Charrúa" translates literally to "claw of the Charrúa". It refers to the native will of the people, one they have inherited since antiquity. It was with this will that they dominated against oppositions on the pitch. They came into the 1924 Olympics as relative unknowns to the Europeans, but exited leaving their competitors overwhelmed and spastic. The applause towards the national team was general. "A revelation! ", wrote the French essayist and novelist Henry de Montherlant. 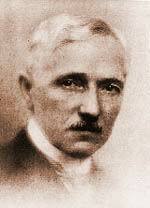 Upon being asked if the English might still be superior, Gabriel Hanot, later editor of L'Équipe, replied decisively: "It is like comparing Arab thoroughbreds to farm horses." With their football Uruguay had built a model for world. They did not require any advances in sports medicine to accomplish it. If anything, they started with inferior equipment, and there was no singular scientific revolution in tactics behind their victories. Instead, theirs was a victory through pure self belief. It was a victory through pure ethical conviction! "But how," we asked, "before playing, before stepping into the Estadio Centenario, the Argentineans, because they won a mistaken match against the Olympic and World Champions, could say that the 'Champions of the World' are returning to Montevideo?" This was a declaration of war. A cry of war, and the championship developed psychologically into a great war between Uruguay and Argentina." The disagreement between the two sides raged prior to kickoff, and the teams could not even settle upon which ball to use. FIFA finally intervened and allowed Argentina to use theirs for the first half, while Uruguay were allowed to play with the ball of their choosing for the second. Referee John Langenus was convinced to oversee the match only hours before it began. A boat was arranged for him just outside the harbor, in case he needed to make a hasty escape. More than 30000 Argentine fans themselves braved the dense fogs and traveled on boat to witness the final, but less than half managed to reach Montevideo on time. The away support urged their team on with cries of "Argentinos, Argentinos! ", but they were quickly overpowered by the complementary roars of "Uruguayos, Uruguayos!" from the home support. The two teams in the final contained an array of fascinating characters. For Argentina, centre-half Luis Monti brought a subdued performance, although he would later win the World Cup with Italy after he moved there to establish a storied career with Juventus. Monti was known as "Doble Ancho", or double-wide, for his ability to cover the entire pitch. The Argentine forward Francisco Varallo would live to be the last surviving member of the 1930 World Cup at 100. He was nicknamed "cañoncito", the little cannon, for his striking ability. Also playing for Argentina was naturalized Canary Islander Arico Suárez. He would be the only Canary Islander to appear in a world cup for 80 years. For Uruguay, the right-back José Nasazzi was captain in the final, and he is still regarded as the greatest player the country has ever produced. Having already captained his side in the 1924 and 1928 Olympics he was known as "El Gran Mariscal", the grand marshall. In midfield, was fellow veteran José Andrade who was also part of the 1924 and 1928 sides which won the Olympics. Though he was a right-half, Andrade was renown for his ball skills and was nicknamed “La Maravilla Negra”, the Black Wonder. In the front line, Héctor Castro cast a determined figure. Nicknamed "El manco", one-armed, he had lost his right forearm in a gruesome electric saw incident at 13. Alongside him was inside-forward Héctor Scarone whose 31 total goals in 52 matches for his country, puts him at top-scorer even to this day. The match itself began with both teams launching fervent attacks. After 12 minutes the home side opened with Pablo Dorado striking a low shot from the right. Argentina responded with goals by Peucelle and Stábile bringing the scoreline to 2-1 in favor of Argentina at the break. After the break though, the match ceased to be a competition. Perhaps boosted with the advantage of using their chosen ball, in the second half Uruguay quickly took control with goals by Cea and Iriarte. At 3-2, a goal by Castro would be all that was required to seal the victory in the dying minutes of the match. 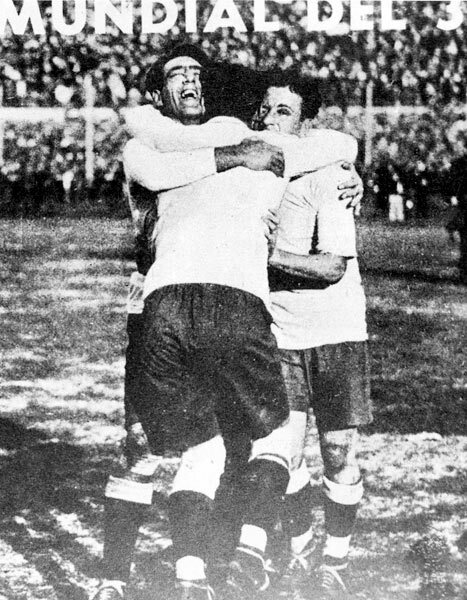 The celebrations which accompanied reverberated throughout the stadium, and eventually they would be carried out into the streets of Montevideo and the South American continent as a whole, although in Argentina the population remained fiercely bitter. Amidst all of the rejoicing, the most poignant moment came not when the players held the inauguration World Cup Trophy, a statuette of the Goddess of Victory Nike lifting an octagonal cup, but rather when the Uruguayan flag was raised on La Torre de Los Homenajes. The moment served to re-emphasize that Uruguay, a relatively small nation of only 2 million inhabitants, were still the champions of football, and now they were the first proclaimed champions of the world. Even while they celebrated being on top of international football, anger remained in Montevideo over the refusal of European teams to participate. It was so intense that four years later, when the World Cup was held in Italy, world champions Uruguay became the first and only team to refuse to defend their title. When Uruguay returned to the World Cup in 1950, they would regain the championship, but afterwards the national side quickly deteriorated, even failing to qualify in 1958. Worse the philosophy of La Garra Charrúa, which can also translate idiomatically to "strength" or "guts", was perverted so that Uruguay adopted an aggressive, defensive style of play, untrue to the country's roots in the game. It was only in the 1980s and 1990s with the emergence of elegant players like Enzo Francescoli when there would be any attempt at restoring that elegant attacking play. But slowly Uruguayan football would be rebuilt, until most recently at the 2010 World Cup Uruguay entertained crowds to a surprise semifinal appearance. They did so with the impressive attacking players like Diego Forlán and Luis Suárez. Forlán would go on to win the Golden Ball despite competition from star players such as Xavi, Iniesta, and Sneijder. Still, anyone watching Forlán's play would agree with the ruling. In the age of swift, agile dribblers like Ronaldo and Messi, Forlán's dribbling also carried the power of older players. His impressive balance and physique made it seem as though the opposition would not be able to tackle the ball away from him even if they reached it. His passing was direct and his shots were bold, with many coming from long distances and absurd angles. His play was likely closest to La Garra Charrúa of the early Uruguayan attackers. It was dynamic, yet still powerful and fearless. As a whole, the Uruguayan team played in striking contrast to the other teams at the Cup. While most of the sides in South Africa were cautious and restrained, Uruguay often attacked from the outset, looking to take control in matches. The team maintained to always define the way the match was contested, refusing to let the pressure of winning define their play. After 80 years, once more it was a simple ethical conviction that made all the difference. After being led astray for decades by cynical, defensive tactics, Uruguay finally prevailed by returning to the earnest attack-minded play they valued in 1930. Perhaps it is not so surprising considering that after one has tried every other route, be it underhanded or not, returning to one's ethics is the only possible change that can make a difference. Of course it is all much easier when you remember that fact from the outset. Sources for this article will be made available upon request. I want the sources. ALL OF THEM.